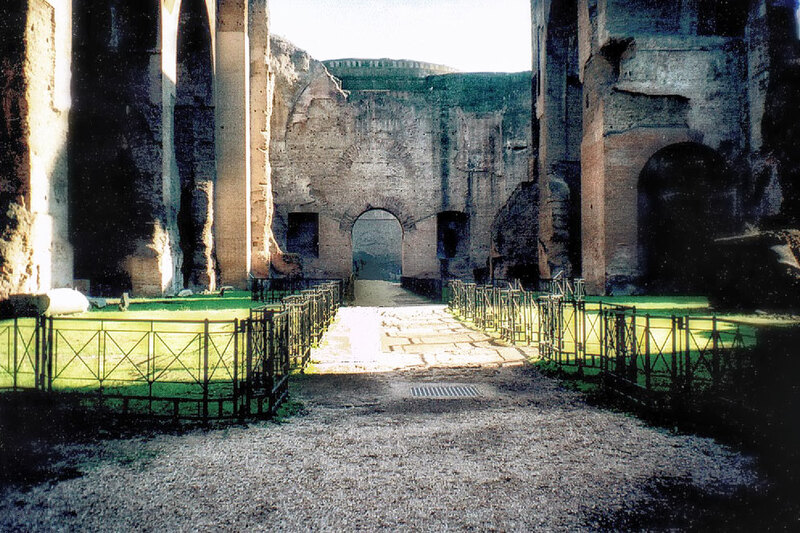 I stood on a hill overlooking the Baths of Caracalla (Terme di Caracalla). Though the ruins are immense, only a fraction of the original complex remains. There’s a rectangular grid of stone walls, a multitude of crumbling arches, and a shattered dome. In ancient times, there would’ve been swimming pools, gyms, saunas, even libraries — all open to the Roman public, free of charge. “Yeah, awesome,” said the other. Although my knowledge of Roman ingenuity had obviously impressed them, the girls chose to terminate our conversation at this point. There’s a painting by Joseph Severn in the Keats-Shelley House (at the Spanish Steps) that shows the poet perched above the overgrown ruins, notebook in lap, pen in hand, finger on temple, deep in contemplation. I wished I could’ve seen the baths as Shelley and Severn had: undiscovered, inspiring, a sanctum of nostalgia where you could escape the present and ramble through a distant, enthralling past. Fortunately, the baths have not entirely lost their power to evoke the splendour of imperial Rome. Inside, I studied the intricate floor mosaics, and wandered through old gymnasiums where boxers and wrestlers had once trained. 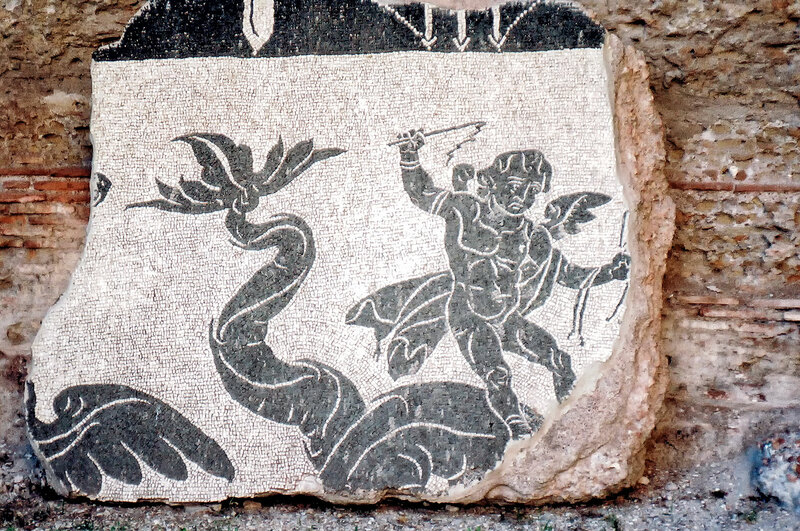 Leaning against the walls were shards of the original tile flooring, with cracked depictions of bulls and horses and warriors battling sea monsters. The baths are most famous for their arched vaults, some soaring over 100 feet. Even in their deteriorating condition, they are a sight to behold. I wasn’t the only one awestruck by the architecture. A bearded vagabond, bearing an enormous backpack, almost stumbled into me, so spellbound was he with the dizzying upward view. His eyes, framed by long strands of greasy blonde hair, widened with wonder. I suspected he was either enjoying the effects of a powerful hallucinogen, or had been out in the sun too long. He eventually ceased whirling and began to move away, gawking at the ruins, muttering incoherently. “Oui, of course,” he said. “Me too,” he said, rather commandingly. He sloughed off his backpack and dug through it. A pile of befouled underwear and socks formed at his side, followed by a thermos, a frying pan, some sweatpants, a roll of toilet paper, and an overripe cantaloupe. “Ah!” he said, uncovering his camera at last, and setting it aside. He swept the rest of the junk back into his pack, all except for the cantaloupe. I reached for the camera, but the Frenchman indicated that I should wait. He began inserting various memory cards, trying to find one with some empty space. He’d clearly been on the road for an extended period, because every card seemed to be full. I wanted to leave, but there is a code among travelers that requires photographic reciprocation. The Frenchman clicked through his photos, looking for some inferior shot to delete. He hadn’t acknowledged my presence for five minutes. After changing cards a few more times, he finally deleted something and gave me the camera. Then he sauntered over to the arch and struck a pose best described as jaunty. I took the picture and carefully returned the camera to him; he shoved it into his backpack like an old boot. “You should have a lens cap on that,” I said. The Frenchman shouldered his gear and started off. Later, on my way out, I spotted him sleeping on a bench near the toilets. There was a half-eaten cantaloupe on the ground beside him, with a pigeon pecking away at it. Tickets: 6 euros. Visitors under 17, free. You can see twenty-two well-preserved columns from the Baths of Caracalla in the church of Santa Maria in Trastevere; they were taken there in the 12th century. The first Three Tenors concert with Placido Domingo, Luciano Pavarotti and Jose Carreras took place amidst the ruins in 1990. 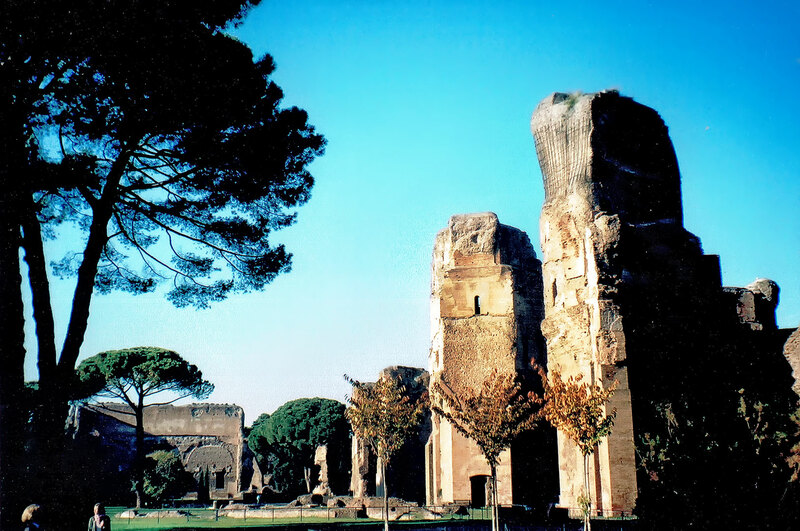 Terme di Caracalla is an amazing venue to enjoy famous operas during the summer season.